A 24/7 hay supply for horses. The past two years here in Texas have been a hay nightmare. We are in the middle of a predicted 7-10 year drought and finding hay last year was very difficult. If you could find it, it was either expensive or was probably a type of hay that your horse was not used to. Mine are used to Coastal Bermuda. I own two extremes of body types. I have the easy keeper in Misty, my Colonial Spanish Mustang, and the "fight to keep weight on" in my high calorie keeper, Nan, my Thoroughbred and current competition horse. What to do? Well, I had to educate myself on feed, both grain and hay, and here is what I learned and established as my feeding program. I am a firm believer that when faced with high metabolisms like Nan's, one is better off increasing the poundage of roughage/fiber (hay) than grain. I did make one change in her grain. I switched Nan over to a high fat, 12% protein complete feed that let me keep her intake of grain poundage the same but increased her calories per feeding. 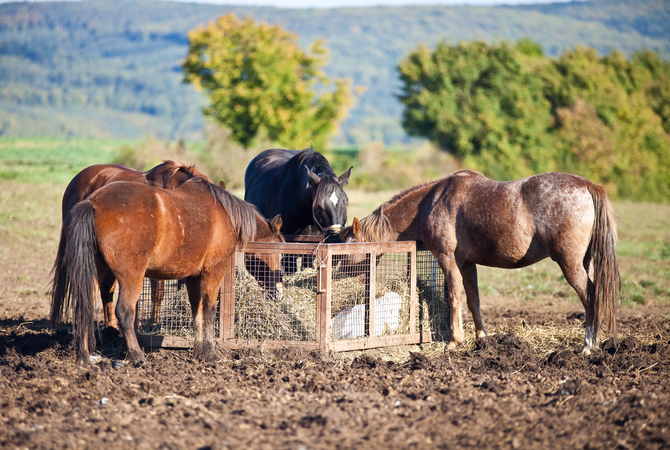 Horses naturally self-limit intake when ample supplies of food are present. 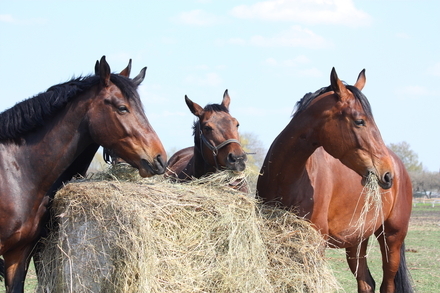 High fiber, low sugar and calorie hay can safely be fed to most horses free choice. During the winter when it is harder for her to keep the weight, I do two additional things. I supplement her grain with an even higher fat top dressing and I use both a 3 season blanket as soon as late fall hits and our night temperatures drop below 60 and a heavier blanket when the temperatures drop below 50. In some cases last year, I even double blanketed her when we dropped below 32 degrees... and yes, Misty got blanketed too, just not as often as Nan as Misty will develop a winter coat and Nan NEVER has. BUT the most important thing I did was switch from weighed hay flake feedings to free choice hay. As in any feeding program, you should have an accurate idea of your horse's weight. EquiMed's horse weight calculator allows you to determine your horses weight based on some simple measurements. The calculator includes Donkey and Foal calculations also. Most experts say that horses should get 1-2% of their horse's weight in feed, and of that, 70% should come from roughage/fiber (hay). I believe that you should feed as much roughage as they can eat that keeps them at a healthy weight and you as the owner are going to know that number best of all. For more information on what and how much to feed your horse, see EquiMed's horse feed calculator. BUT let's take the 70%. For Nan, that broke down to about 20-22 pounds of hay a day broken into two feedings. Now, I am lucky in that my horses live with me so I know I was feeding 20-22 pounds per day. Two things I need to note here. 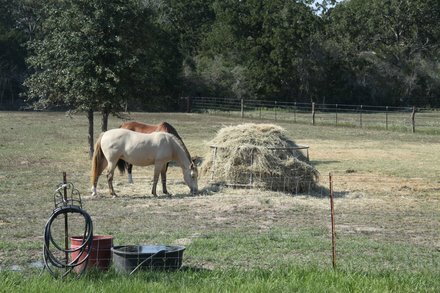 If you have observed your horses at feeding you will know that as soon as the grain is gone, they are on to the hay and that is gone in about an hour or so, which leaves them roughly 7-9 hours till the next feeding. If you are in a small turnout situation or small acreage that is essentially a dry lot, you have left your horse/s with nothing to do for a number of hours. It is a fact that horses do better mentally and physically when they can graze all day. As prey animals, that is just the way they are built. When I used square bales, I found that I was going through roughly a bale every three feedings, and at $15 a bale (2011 prices) that was a LOT of hay and a LOT of money. Even at the height of "crazy hay prices," a round bale was running $125 for what they call a 4x5 bale. That size bale has about 20-22 square bales in it. Quick math... I was getting more hay for less money on the round bales AND I was still fighting to put and keep decent weight on Nan. 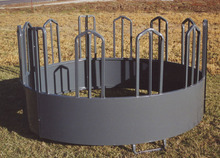 Round bale feeders reduce hay waste and facilitates multiple horse feeding situations. Note that you can use a round bale, or multiple small bales to fill the feeder every two or three days. See caution below. I purchased my first round bale and let the horses decide when to eat. I really kept an eye on them for the first bale and they went nuts... it was like a non-stop eating buffet and they stood there all day except when they came into their stalls for their grain. After the first bale was done and I put the second bale out immediately, it did not take them long to figure out that it was "always" there and they began to move around and graze all the rest of the area and just come back and grab a bite and walk off. There was a bit of a learning curve, but all in all I was down to about 1.5 round bales every thirty days, my hay cost was back to manageable, and while Misty developed a bit of a hay belly, Nan was getting sleek and filling out, even in winter. Now before you run out and purchase your first round bale and go full tilt on free choice, please allow me to pass along some wisdom/advice from my learning curve. I cannot say this enough times. Make sure that you maintain LOTS of fresh water in clean barrels, buckets, or whatever you offer your water in. I clean my barrels once a day and I dump and refresh the water two times a day EVERY day. Here in Texas, intense heat is an issue, and if the water is too hot, they will not drink. If the water is too cold, they will not drink. Water intake is what keeps impaction colic at bay and one of the BIGGEST CONS for free choice hay is when the horse does not drink enough. You do not want to find out the hard way - a boarding barn in my area did, and each time the vet who did the autopsy said exactly the same thing... IF YOU FEED FREE CHOICE HAY, FRESH WATER IS IMPERATIVE. DO NOT buy hay off the side of the road. Unlike square bales, round bales can hide lots of nasty things - burrs, trash, beer cans, mud flaps from 18 wheelers ( I kid you not, I found one) - SO make sure that you only buy hay from a reputable dealer and look at their square bales. That will tell you a lot. Most of the time, the dealers will bring in round bales and break them down into squares to sell; they make more money off the squares than the rounds. Reputable hay dealers will talk to you about their hay. They have NO problem discussing the hay, where it is from, what type it is, and they KNOW that word of mouth is how they make sales. Bad hay means no sales. Tell them that you only want HORSE QUALITY round bales. There is a difference between horse and cattle round bales and dealers know this as well. Yes, they are going to be a tad expensive, BUT there are several reasons for this purchase. One piece rings mean that the horse is less able to get into trouble with the hay ring... another CON of free choice. Hay rings also let you take the netting off of the hay bale, which I HIGHLY recommend. Same with small bales. NEVER leave netting or bailing twine in the feeder. It is entirely possible for horses to ingest this and the string will wrap the intestines and you will have a highly expensive impaction colic or possible death... another CON of free choice hay. HOWEVER, it needs to be noted here that if you are a cautious horse owner, this is highly unlikely. The last reason for the hay ring is less waste. For whatever reason, horses seem to view hay as this highly desirable poop/pee attractant... and they will pee in it, poop in it, and then lay in it, thus wasting vast amounts of hay, BUT with the hay ring, the loose hay is contained and less is wasted. As you can tell, I am a HUGE proponent of free choice. I believe that it makes my horses happy and sane, as well as healthy. 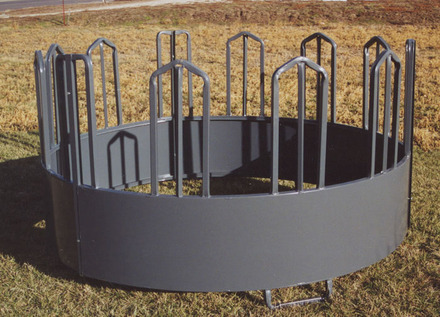 Common features of feeders designed for horses reduce the number of entrapment points. © Silver Star Industries, Inc.
To avoid accidents, you should only use a round bale feeder designed for horses. These feeders do not have a bar across the top, and have other design features that minimize the potential for entanglement. The one-time investment will reduce the amount of hay trampled and wasted.